In this helpful guide to meditation for beginners, Andrea Bertoli from Vibrant Wellness Journal explains how meditation is easier than it seems. If you’ve ever been daunted by the idea of meditating, or just wondered how exactly you should do it (there’s a lot of different styles! ), this is the guide for you! Despite being a long-time yogi, I’ve never tried meditation. I know that meditation offers a host of benefits, like better sleep, less stress and even smarter and happier, but it’s just not been something that I wanted to pursue. But while we were at Wanderlust Squaw Valley a few weeks ago I decided to take a chance on my very first meditation class. And I loved it! 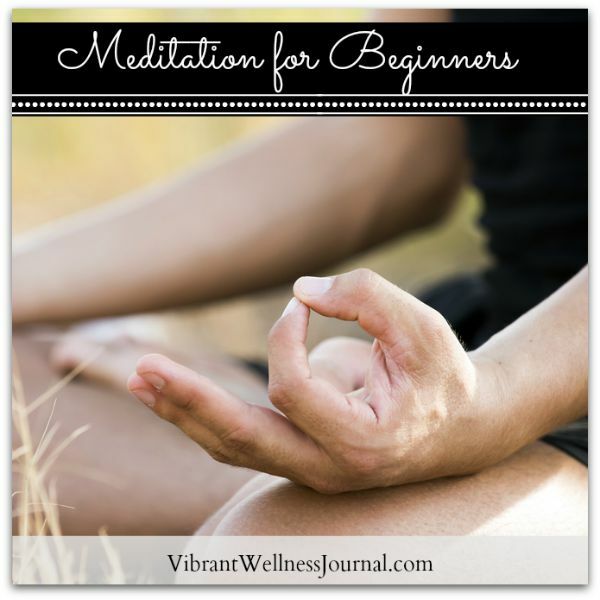 Here are some guidelines to help make meditation for beginners a bit less scary. 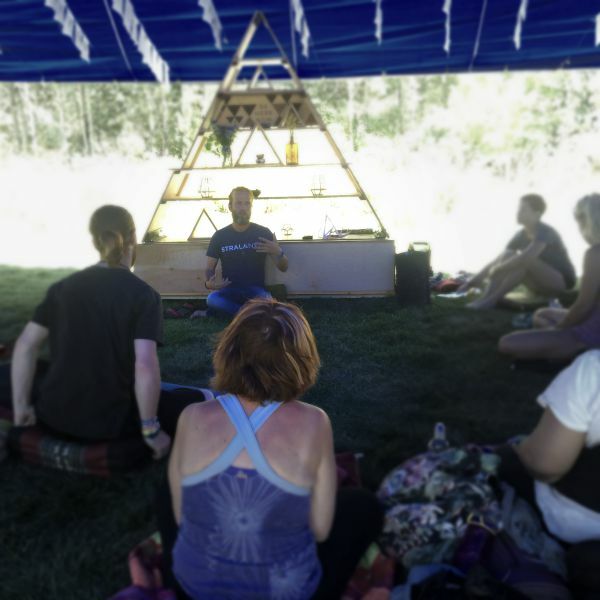 I was excited to check out ‘The Science and Spirit of Mantra’ class with Charlie Knoles, long-time meditation teacher, at Wanderlust Squaw Valley, mostly because I’m very scared of mantra. Mantra, or repetitive chanting, is usually done in Sanskrit, but mantra can be in any language. Though it’s common in a lot of yoga classes, it’s something (along with meditation) that I’ve always shied away from. I’m pretty good with my Om; I like feeling a room full of people vibrate to the sound of the universe. I can even get behind some Om Shanti, a vocalized offering of peace to the world. But anything beyond those three syllables and I clam up and refuse to participate. So I was super excited (and a bit nervous, honestly) to attend Charlie’s class on the lawn on Sunday. But it was a lovely experience, and I took copious notes (which is probably what you should NOT do in a meditation class- but it was for research!). I’m so happy to say it was a lovely class, and I walked away feeling a bit less freaked out by meditation, and mantra in general. Charlie was a light-hearted, funny, kind teacher that made it seem like anyone can meditate, even beginners like me. Here are my key takeaways from Charlie’s class. Like entering a room with good music, Charlie says that mantra can take us places beyond words, and can thus help us connect to the place beyond our brains during meditation. He says that mantra is a way to connect with our ‘primal brains;’ that is, a consciousness beyond our thinking brain, beyond the surface of consciousness, beyond our current body. He offered the example of poetry: so often the words have one meaning, but the poem evokes feelings beyond the words. This is the place mantra can take us, and it implies a deep, connective experience throughout all of humanity. Charlie spoke at length about how mantra is a universal truth: the same syllables often are used across the globe in various religious traditions. Whatever the words, or the meaning, mantra can take us to a quieter place inside, and connect us to larger spiritual truth. Mantras act as a shortcut to finding meditation. The other point he made about mantra was that sounds have powerful resonance, and this can help us relax into our meditation. Just as plucked stings of an instrument will send waves of resonance to other instruments, mantra can spread throughout a room, a group, and if you’re feeling it, to the whole world. He also dispelled some myths about meditation. He says the goal of meditation is not to block all thoughts, but instead to allow our thoughts to flow. By flowing with our thoughts– rather than against them– we can follow our mind to the quiet place. Mantra is helpful in meditation to help us find the quiet place by giving our brain something to focus on. It doesn’t matter what the mantra is, but following it from a vocalized chant, to a whisper, to a thought is one of the ways to find your meditative state. He says the other big misconception is that your brain must be free and clear in order to meditate; but really, he says that sometimes there are quiet practices, where your brain can find these quiet spots. And sometimes we experience a thought-filled meditation, and that’s okay too. The point is to allow ourselves to experience both, and enjoy what each has to offer. He offered us a mantra to try. He explained that some mantras are very specific, but others are very general and can work for lots of different people. He shared with us the simple phrase So Hum. After about 20 minutes of discussion, Charlie let us find our own meditation with the mantra So Hum. We sat cross-legged on cushions in the grass, with the brisk wind of Tahoe on our skin. We closed our eyes, and began to chant the mantra. The chanting became quieter and quieter as people began to sink into their meditation. In the 20 minutes that my eyes were closed, the mantra came and went, as did other thoughts– what are we having for dinner? Should I put on my jacket? Did I drink too much coffee this morning? What should I do for work next week?– but as these thoughts came, I fell back into the mantra again and again. After the 20 minutes, I felt very relaxed and calm, and knew that I wanted to learn more. In the few weeks that have followed Wanderlust, I’ve not hopped on the meditation cushion again, but it’s definitely something that I won’t shy away from any longer. I have been going to more yoga since Wanderlust, and that feels pretty dang good too! I hope that my meditation experience can help you find your practice too! Here’s to less stress and a happier brain! Reposted with permission from Vibrant Wellness Journal. Group Meditation: Coming together through chanting.